It’s September 1 tomorrow, which means it’s finally Force Friday II—the day tons of new, wonderful Star Wars: The Last Jedi toys are out. But while elsewhere you can see the heroes of the galaxy far, far away in figure-based action, io9 can exclusively reveal a few of the new (mostly) villainous toys making their way to shelves this Fall. Hasbro’s six-inch Star Wars: The Black Series line is expanding on Force Friday with brand new figures based on The Last Jedi and more, with a series of exclusive action figures at select retailers. Perhaps most important of all to fans is the first-ever 6-inch scale action figure of Supreme Leader Snoke, who will exclusively retail at Gamestop this Fall for $35. The figure, based on Snoke’s appearance in the new movie, features a fabric robe and comes with his very own throne to sit on. A supreme leader needs protection, though, which you can get from this 6" Elite Praetorian Guard ($20) exclusive to Amazon. Based on one of the several subtly different designs for the First Order’s answer to the Imperial Royal Guards, this figure comes with both a sword and a ginormous heavy blade. If one guard isn’t enough, however, then this “Guardians of Evil” set exclusive to Barnes & Noble, Gamestop, and Disney Stores. 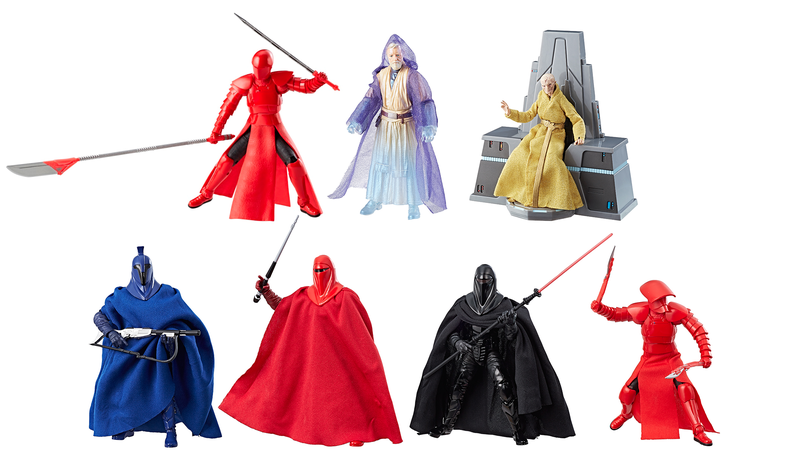 This $80 set of 6" figures tracks the history and evolution of the Royal Guard design in the Star Wars saga, from the blue-clad Senate Guards of the prequels, all the way up to another Last Jedi Praetorian, this time with a new helmet and two bladed weapons exclusive to this version of the character. But hey, maybe you want a shiny new Star Wars action figure that a) has nothing to do with villains, b) nothing to do with The Last Jedi, or c) is actually shiny. If so, I’ve got good news for you: Walgreens will have this $20 exclusive version of the 6" Obi-Wan Kenobi figure, based on his appearance in Empire Strikes Back and Return of the Jedi... which is to say, he’s dead. Or, more specifically, a Force ghost, rendered in partially translucent plastic to recreate his spiritual form. All of these figures will be available this fall, before Star Wars: The Last Jedi hits theaters this December.